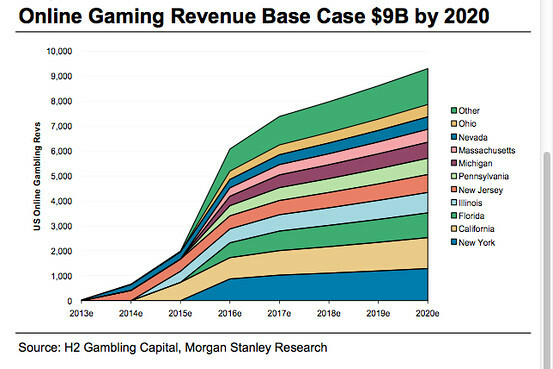 Browse: Home » Online Casino Market Forecasts: US 9.3 bn. Goal Doomed To Failure? Morgan Stanley, one of the largest American bank holding companies referred to financial conglomerates class, has recently published the information that according to its research online gaming market will not be able to generate a profit of $5 billion expected by the United States government by the end of 2017. Given the current state of affairs in this area and stagnated profit growth, the online casinos operators will be able to replenish the treasury with the total of $3.5 billion in taxes approximately. Financial experts have gone further and announced that instead of the expected $ 9.3 billion by the end of 2020, the country will receive only $8 billion from the online casino industry. Being an economist is not obligatory to understand that over the years, the profit of online casinos will grow but very slowly. Both investors and officials are very concerned about these predictions, because the expected amounts are supposed to be actively used. ‘When we gave the public the first financial forecasts for the USA online casino market, the fact should be underlined that we based on the averages figures. Now when enough time has passed since legalization, we can more accurately predict the profitability of the industry,’ the official research note states. The research group increasingly refers to the lack of profit from online casinos in the state of New Jersey. Instead of the projected $541 million annual revenue, online enterprises have managed to generated almost twice as less – about $ 209 million. Analysts cite a number of problems faced by the state in the way of legalizing online casinos, which is believed to be primary cause for unexpectedly low index. In general, experts believe that the obstacle to increasing the volume of profit has become a problem with the definition of geolocation of players, problems with acceptance and issuance of payments, as well as active online casinos promotion ban initiated by opponents. Fitch Ratings in its projections doesn’t expect NJ to bring more than $200 million annually. And the company’s forecast is far from being improbable, the company’s experts are confident that a cunning plan between Delaware and Nevada will work perfectly. The agreement achieved on February 25, 2014 by the American states of Delaware and Nevada implies merging their poker websites. Now, any citizen of one state can take advantage of both poker operators. In order to increase the accuracy of their calculations, the experts took into account the intentions of other American states to legalise online casinos. In their view, the appearance of any competitor, even the young and inexperienced, can significantly affect the number of regular casino players. Morgan Stanley also added that, most likely before the end of this year, such states as California and Illinois will be able to legalize online gambling within their territories. They are also confident that this year the process of legalising online casinos will certainly not affect Colorado, Louisiana, Massachusetts, Mississippi and Ohio. It should be noted that since the beginning of this year, the players on the websites of online casinos based in New Jersey won $19.7 million. Now almost 250,000 players are registered on the websites of state-based enterprises.